Victoria serves for all kind of joints with various applications as per the site requirements such as Silicone, Polysulphide, Polyurethane, Acrylic sealants which are durable and flexible make water tight bond with most building material, in particular, stone, masonry, glass, wood, steel, Aluminum, ceramics and painted surface for joint sealing and joint filling of buildings. We even give the supplies for the Shalideck Boards, Silfil/Flex Filler Boards, etc. Victoria is always on the path of innovations and as the market is expanding and the need is there for big joints as per the structural consultants in the buildings and simultaneously the architects need the aesthetic joint coverings complying the requirements of the consultants, hence, we comply the service for these joints and giving the solutions with EPDM Gaskets, Extruded Aluminum Profiles for the covering and Turn Bar Systems for Seismic Joints. As we promote the company Balco Inc. USA, in India which is the major manufacturing company in USA in expansion joint systems & coverings. � Structural, Roads, Bridges, etc. Used where expansion joints are located under tennis courts, concrete pads, sidewalks, garden roofs, �green � areas and parking lots. 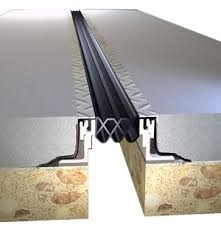 A flexible exterior vertical wall expansion joint cover that has secondary water.